According to French bank Natixis, the turn of the year will free gold from the influence of an overbearing dollar. Bernard Dahdah, the bank’s precious metals analyst, told Kitco in an interview that the greenback will retrace as the Fed draws its hiking cycle to a close. Dahdah says the change in the Fed’s policy will coincide with several central banks around the world who are applying their own tightening schedules, which will act as another source of downwards pressure on the dollar. Beyond currency changes, Natixis also expects gold to benefit from a general slowdown of a peaked-out U.S. economy. The bank said that the federal budget deficit will become more prominent in 2019, evaporating any remnants of tax cut-fueled optimism. The bank predicts limited growth prospects and a return of fear to the markets should boost gold prices to an average of $1,275 an ounce in 2019, with the potential for $1,350 during the year. Natixis also predicts a good year for silver, stating that investor appetites will shift to favor commodities such as precious metals. This will allow silver to lessen the gold/silver ratio and shoot up to $16 an ounce in 2019, along with a possible move towards $18 an ounce. In a recent piece on Money Morning, analyst Peter Krauth blames gold’s recent dip on bearish speculative positions. Krauth notes that large speculators had recently increased their bearish position in gold futures by 67%, likely because of the U.S. dollar’s new high. While this was enough to briefly push gold into the red, the metal rebounded almost immediately and is still holding onto its gains. And although everyone is talking about the dollar rally, Krauth points to different technical charts that show gold has more momentum than the greenback. As Krauth explains, the U.S. Dollar Index (DXY) might be forming a bearish head-and-shoulders pattern to cap off its record-setting run. If true, the DXY could end up falling from its current level of 97 to below 94, translating to good things for the yellow metal. Gold’s own chart suggests that a rebound is coming, with Krauth pointing out that a bullish ascending triangle pattern may be forming as gold moves towards the next resistance at $1,240. Past that, Krauth lists $1,265 and $1,300 as the next targets on gold’s rebound path. The latest report by Scotiabank goes hand-in-hand with Krauth’s analysis. In the report, the bank’s team stated that gold prices could soon be trending upwards as volatility and inflation become more present. The bank added that renewed risk aversion will take some of the money away from equities and bonds and direct it towards gold. The latest report by Goldman Sachs states that gold and palladium will each enjoy a price jump as investors assume a more defensive positioning in their portfolio, reports Kitco. The metals could also move up due to possible hitches in the U.S. economy in 2019 and beyond. 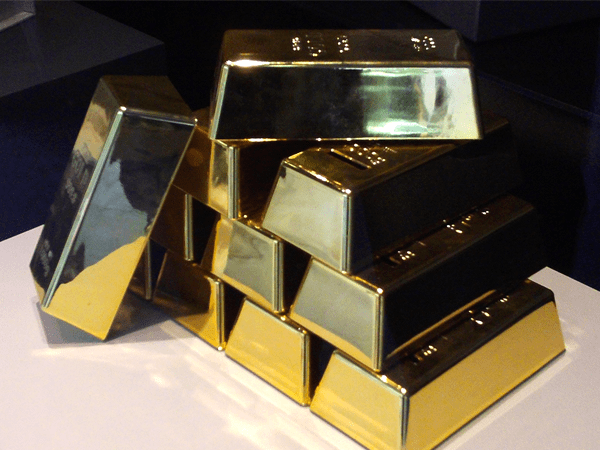 Goldman analysts noted that strong central bank bullion demand remains a key component of the gold market, especially since some countries have returned to buying after years of absence. The team also touched upon the overwhelming bearishness by large speculators, calling it unsustainable and predicting a reversal as the dollar traces back. Goldman advised investors to assume a long position on gold since the bank expects commodities to be thrust back into the limelight and revalued. Until this happens, the analysts noted that current precious metals prices make for a very attractive entry point. Goldman’s team is likewise optimistic on palladium, calling for it to outperform platinum in the near future due to supply-and-demand dynamics.